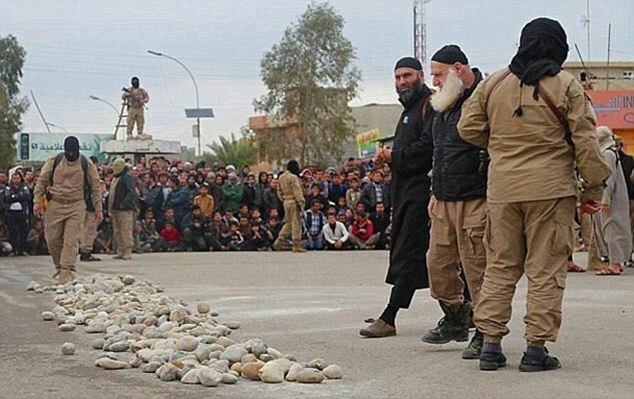 Two teenage girls have been stoned to death by ISIS extremists after they were found in a house with two men – who were each flogged 50 times. The girls, Hasna, 17, and Madiha, 16, were accused of committing adultery and executed in front of a crowd of hundreds in Deir ez-Zor city, eastern Syria. Two older men were then sentenced to 50 lashes – also in public – after being identified by a Sharia Court as Abu Zubair al-Idlbi and Maher Hameed. According to the international business times, the Sharia Court said in a statement that the teenagers were arrested in a home ‘with two strangers’.